Al Pacino's got a high-stakes poker game coming up – with Jack Kevorkian. "He's invited me to Detroit to play poker. 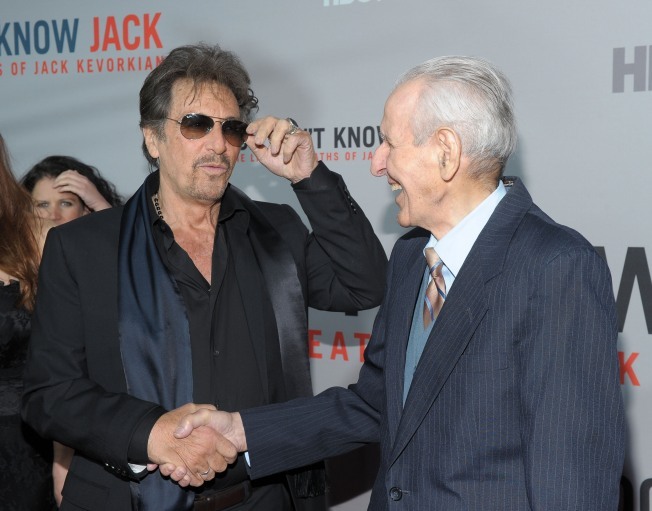 For Jack, I think I'll go do it," Al told Access Hollywood at the premiere of HBO's "You Don't Know Jack" on Wednesday. In the television original movie, Al Pacino transforms uncannily into the doctor, without having ever even having met the real-life Jack. The pair finally came face to face on Tuesday, just before the premiere. "I spent time just absorbing him," Al said of his preparation for the role, which illuminates the private life of the physician once dubbed "Dr. Death" for his role in a number of physician-assisted suicides. "It just shows you sometimes how … some people don't understand how to be in the public eye, how to deal with media and cameras, but [in this film], with a guy like Jack, you know him longer, you get a sense of who he is. He's totally funny and self-deprecating. Big-time smart." And a big-time poker player, as the doc himself told Access. "Anybody who plays poker can't be all bad," Dr. Kevorkian said of Al, noting that they'd be playing soon. "We will, in the future!" As for Al's performance, Jack was impressed. "It's unbelievable, I was shocked," he said. "You Don't Know Jack" premieres on HBO on April 24. VIEW THE PHOTOS: Totally Tuned In! The Stars Burning Up HBO!